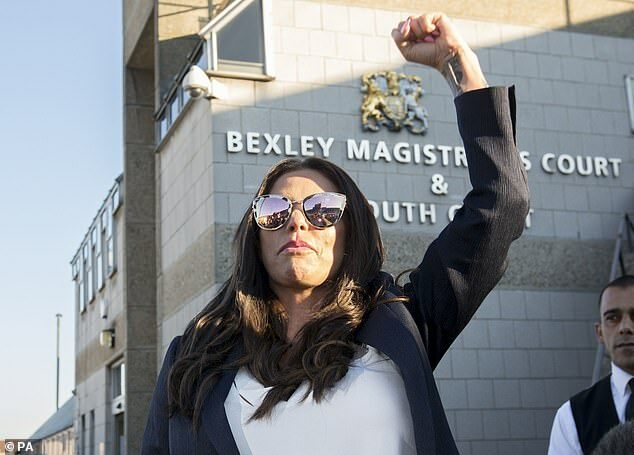 Katie Price has emerged for the first time since her court case for drink-driving. The model, 40, kept a low-profile as she emerged in London two days after she was banned from driving for three months and fined £1,500 after being found slumped in a ‘very’ drunken state in the back of her vomit-covered pink Range Rover. After her defiant display outside court on Monday, Katie shielded her eyes behind sunglasses while holding an umbrella branded with the name of a car company over her face before pointedly stepping into the backseat of a chauffeur-driven car. After her appearance, The Sun revealed Katie had been investigated by police for a fracas at the school gates with her ex Kieran Hayler’s girlfriend Michelle Pentecost – however insiders told MailOnline the scenario was ‘blown out of proportion’. The incident, which happened at the West Sussex school in September, saw Katie ‘shout and swear’ at Michelle, who reported the star to police, with the site now alleging two other parents are preparing to speak to police. Insiders close to Katie however told MailOnline: ‘The whole situation is blown out of proportion and totally ridiculous’. Representatives for Katie declined to comment when approached by MailOnline. Elsewhere, Katie was keen to show she was nowhere near the wheel on Wednesday as she headed out and climbed into the backseat of the car. She was also pointedly holding an umbrella adorned with the name of the cab company she was using to ferry her around. Clad in a white ensemble with acid wash jeans, she kept things more low-key than usual while keeping her face fresh and shielded. Katie was almost twice the legal limit after drinking four pornstar martinis when she was arrested in the early hours last October in Greenwich, South East London. Despite this, on Monday, she brazenly vowed to buy a new car as she spoke outside Bexley Magistrates’ Court. ‘I was given a choice of having 10 points on my licence or to be disqualified for three months,’ she said. She was said to have climbed into the back seat of her 4×4 to avoid being caught as the driver last year – but had bloodshot eyes, slurred speech and smelled of alcohol. The mother-of-five allegedly repeatedly denied she had been driving and claimed the driver was her boyfriend’s friend – and anyone was insured to drive her car if they were aged over 30. She also told the court she was wearing a hoodie, socks and trainers, but no pants, when she was arrested. She said: ‘It was an oversized hoodie but I wore it as a dress’. At Bexley Magistrates’ Court, Price was cleared of drink driving after the judge said there was no case to answer, because there was no evidence of who had been driving the Range Rover before police arrived. She was convicted of being nearly twice the legal limit while in charge of the vehicle. She was banned from driving for another three months and told to pay a £1,500 fine. Along with costs and a victim surcharge, her total bill for the offence came to £2,425. Price had claimed she was not in control of the car and a mystery man had driven it, but Judge Nigel Dean found she was not a ‘plausible’ or ‘credible’ witness.